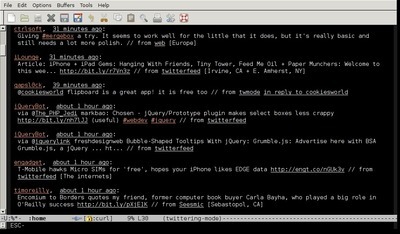 With twittering-mode Twitter can be used from within Emacs. On Debian it only takes an apt-get install twittering-mode to install twittering-mode. 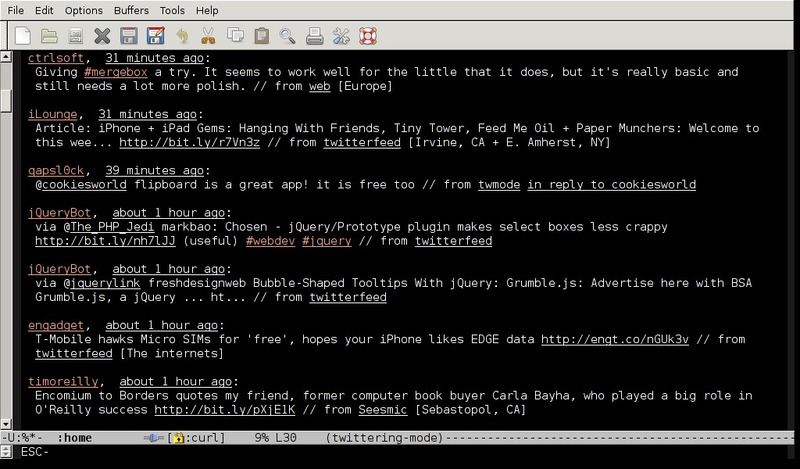 The first line let Emacs load the twittering-mode. The second line let you load the login-credentials for Twitter into an encrypted file in your $HOME. This way you are automagically logged into Twitter after starting twittering-mode. The first time you enter this command, an URL is diplayed. Opening this URL in a external browser let you connect to a special identification function from Twitter. There you enter your username and password. Twitter response with an PIN-number. This is a string of digits. You copy and paste this PIN-number back to twittering-mode. When you have added the twittering-use-master-password to your .emacs file, Emacs asks you to enter a password. This password is used encrypt your Twitter-credentials. Enter the password twice and a small file named .twittering-mode.gpg is stored in your $HOME. The next time you start up Emacs and start up twittering-mode, you are asked the password. When you provide the correct answer. Emacs can login to Twitter. example: put the curson on a hash-tag and hit "v", then the timeline of this hash-tag is opened in a new buffer. Much more information can be found at the very friendly twittering-mode wiki page. A screenshot from Twittering-mode on my netbook after toggling display of icons.